Rider spent six days in ICU. 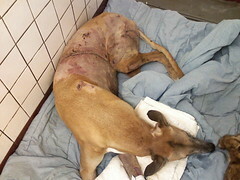 He had his spleen removed and had multiple stitches. I’m sorry I can’t donate at this time but sent the article along to friends in the area. Please tell Lizzie to check with her car insurance company to see if there are any dog related expensed they’ll pay since the dogs were in her car in the accident. Best of luck to all three from us three. Lizzie did check with her car insurance company and her dogs are not covered.